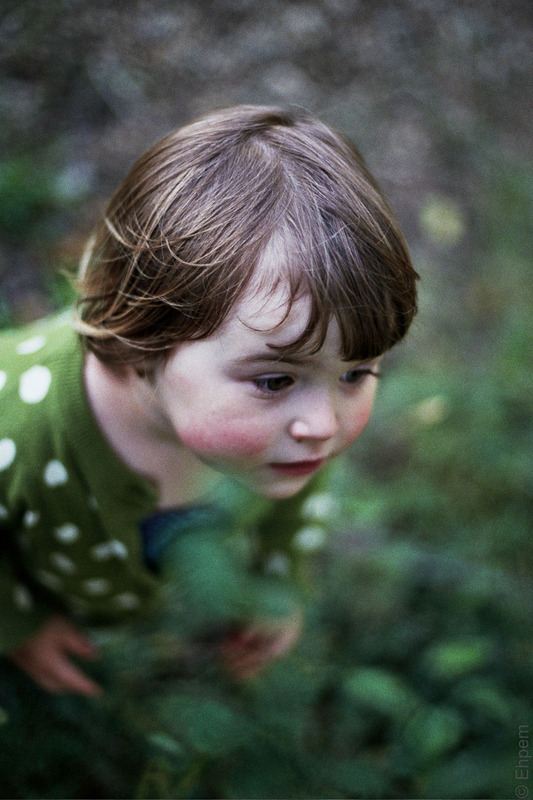 The other half of today’s roll of film, with some of the most endearing shots I have taken of my granddaughter. What a cutie! In June I went to stay with my granddaughter (and her parents I suppose I should say). They had recently moved from near our house to four hours away – a place where they could afford to have some space around them, grow things, and be near some friends. One of the things we did was go for a walk in the woods near their house. It was huckleberry season, an enthralling prospect for a 2½ year old. These pictures are from that stroll in the woods. There are other shots on the roll from this trip which are published on my blog, though these are the ones I like the best. The ones on my blog are in a post called Market Stroll, here. What a delicious little girl! Hi Yvonne – I love the photos from this walk, the shallow depth of field while not advisable with kids was necessary due to the falling light, and it worked out really well. All those creamy green surrounds!